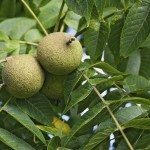 I would like to plant a vegetable garden in soil where there once was two black walnut trees. Would this be ok? Once the trees are removed, most of the adverse effects will be gone within a year or so. If you cannot wait that long, a great way around this is to use raised beds in the area. Then the soil used in the beds will not have the alleopathic chemicals.